One of three Advanced Extremely High Frequency (AEHF) communications satellites operating in geosynchronous orbit is depicted in an artist’s concept. Note the hexagonal gold patches on the earth-pointing deck that houses electronic phase shifters for agile phased array antennas. Orbiting digital switchboard responds directly to combat signals using onboard processors. 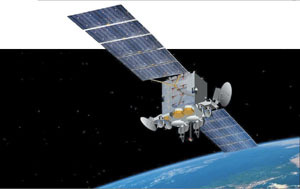 The Advanced Extremely High Frequency satellite is designed for point-on-demand instant communications, providing protected worldwide command and control access within fractions of a second to U.S. and allied warfighters. This spacecraft is taking shape with substantial technical improvements—new phased array antennas, advanced integrated circuits, more efficient waveforms and novel space-based thrusters. An approximately $5 billion program in 2004 dollars, the Advanced Extremely High Frequency (AEHF) system’s payload development is more than 90 percent complete. The United Kingdom, Canada and the Netherlands also are AEHF participants. The first of three satellites in the constellation is scheduled for launch in April 2008, followed by one each year in April 2009 and 2010, according to Col. William J. Harding, USAF. Based at the Space and MissileSystemsCenter, Los Angeles, California, he is the AEHF program manager. Lockheed Martin, Sunnyvale, California, is the prime contractor, with Northrop Grumman, Redondo Beach, California, as the principal subcontractor for the space payload. Technical breakthroughs enable reducing the weight and volume of the spacecraft, permitting satellite launches using the evolved expendable launch vehicle (EELV), Col. Harding notes. The AEHF program is being realigned to better coincide with late deliveries of government-furnished equipment: encryption keys from the National Security Agency (NSA). “With the Milstar satellite system, the challenge has been with the number of encryption keys required, thousands each month,” Col. Harding points out. He is also the Milstar program manager. “AEHF, with its sensing capability and inherent design flexibility, requires hundreds of thousands of keys, making encryption a difficult challenge. However, in meetings with NSA, an executable plan has been developed to assure deliveries when the program needs them.” Nevertheless, slowing the program one year increased costs by approximately $800 million. Operating at 44 gigahertz, the space-based phased array antenna also uses indium phosphide (InP), an advanced semiconductor material, for some of the antenna’s more than 10,000 monolithic microwave integrated circuits. InP ensures excellent low noise, or clear signal, performance. With a more compact phased array, the AEHF system can process greater amounts of information. In the progression of extremely high frequency (EHF) satellites, the total Milstar I system throughput moved from 75 kilobits per second to 100 megabits per second with Milstar II and to 1 gigabit per second with the AEHF system’s extended data rate capability with three satellites, Col. Harding states. Lockheed Martin Space Systems Company develops the ground segment, provides the satellite bus and space vehicle, and is the overall systems integrator and prime contractor for the AEHF system. The company is using a derivative of its A2100 commercial communications satellite bus for the AEHF, Leonard F. Kwiatkowski explains. He is vice president and general manager, military space programs. 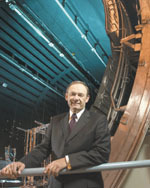 Leonard F. Kwiatkowski, vice president and general manager of Lockheed Martin’s Military Space Programs, pauses in front of the company’s Dual Entry Large Thermal Altitude vacuum chamber used to replicate space conditions. AEHF satellite systems are being tested there in vacuum, including new xenon ion Hall current thrusters. Kwiatkowski, a retired U.S. Air Force brigadier general, managed intelligence, communications and military space programs while on active duty. Among those activities was the Joint Military Satellite Communications program. wiatkowski relates that his company already is involved in early bus testing to coincide with Northrop Grumman’s digital processor and radio frequency equipment payload development. The AEHF bus is a radical departure from Milstar satellites because the unique design is dictated by new technologies. “We will use a series of A2100 subsystems and modify them, principally for the antenna structure—a combination of phased arrays and steerable antennas that have associated anti-jamming features. The phased array antennas will be mounted on the nadir, or earth-pointing, deck of the spacecraft. There also are panels that will extend from the sides of the satellite for other antenna structures,” he says. There are two super high frequency (SHF) downlink phased array antennas, two crosslink antennas and two uplink and downlink nulling antennas to prevent jamming. An EHF uplink phased array, six uplink and downlink gimbaled dish antennas and an uplink and a downlink earth-coverage horn provide communications. The payload encompasses onboard signal processing. Solid-state power amplifiers, which boost the strength of satellite-to-satellite transmission signals, are being used on AEHF in lieu of traveling wave tube (TWT) amplifiers. The multiple power modes enabled by solid-state electronics offer high fidelity, lower power-transmission levels, and assure compatibility with legacy satellite systems. Power output control, while maintaining channel fidelity, is not feasible with TWTs. “The AEHF will use xenon ion Hall current thrusters, a departure from our normal propellant subsystem. This enables us to package more payload with less thruster fuel, which translates to a smaller launch vehicle,” Kwiatkowski clarifies. The AEHF will weigh approximately 13,000 pounds at launch and 9,000 pounds on orbit. “With less weight devoted to thruster propulsion, it may take a bit longer to reach orbit,” he adds. It is anticipated to take 105 days from AEHF transfer to final geostationary orbit at 19,323 nautical miles. “Because we have not previously used these thrusters on commercial or military payloads, a very vigilant risk reduction program is underway that addresses qualification of the propulsion technology,” Kwiatkowski advises. This new thruster technology is focusing attention on possible effects of the gas plumes in space to learn how to avoid contamination of the spacecraft on orbit. “A lot of effort is directed at understanding and characterizing plume effects as accurately as possible on Earth. This includes a great deal of testing and analysis. We expect to have life-cycle plume tests completed by September in our large vacuum chamber. “The degree of development, considering the new technologies undertaken, exceeds all of our expectations. Schedule performance is within 1 percent of the baseline program,” Kwiatkowski emphasizes. “Two years ago, the test plan was modified to include more robust testing of integrated circuit designs. This was accomplished within schedule and without perturbations,” he offers. Contractor attention is focusing on risk areas. However, contractor costs have increased approximately $140 million because there are no reserve funds built into this program. Northrop Grumman’s payload integration and testing in Redondo Beach will begin in April 2006, with delivery to Lockheed Martin in Sunnyvale scheduled for April 2007. This is a year before the first AEHF launch from Cape Canaveral, Florida, probably using an Atlas V 400 series EELV. Meanwhile, engineering model verification work is progressing in Redondo Beach. Emulators are being used while awaiting encryption devices as actual launch hardware is built up. Early integration and testing of the engineering model payload, software, satellite interfaces and user-terminal simulators are reducing the risks associated with the two AEHF flight payloads, according to James Myers. He is vice president, satellite communications, Northrop Grumman Space Technology. The engineering models were produced with flight-quality hardware and processes, enabling early verification of a wide range of requirements. Myers joined Northrop Grumman via the 2002 acquisition of TRW. Alongside the engineering model payload, the integration of Flight 1 hardware is progressing on schedule. “The engineering model uses a full single-string prototype to pathfind and validate various functions. In the case of the onboard router, the program went through a rigorous process of design and critical design reviews before fabrication of 19 different ASICs that make up the payload,” Myers discloses. “In terms of the building blocks for the onboard processor-router, this is it for the ASICs.” BAE is the major supplier and has completed fabrication of payload ASICs, he adds. “We looked hard at overall risk reduction in the payload. ASICs was considered one, uplink and downlink phased array antennas another, and the nulling antenna still another. These are key technologies that enable size reduction of AEHF in relation to Milstar. These antennas and processor technologies are in excellent shape,” Myers stresses. Northrop Grumman is under a $1.3 billion contract with Lockheed Martin through 2008 for the first two AEHF payloads. Long-lead-item procurement funds also are being spent for the third AEHF payload. Northrop Grumman, operating at the highest Capability Maturity Model Integration Level 5, has developed the processes and metrics for payload software design, validation, verification and testing. “To the extent that we can bring this capability to AEHF, we have done so. The experience we have with Milstar and previous communications satellites, which use similar types of software, provides a mature competency,” Myers states. “AEHF will support communications on the move for the warfighter, with hundreds of links per satellite to small 1-foot-diameter antennas, providing situational awareness. AEHF will begin to transform battlespace communications, linking all echelons in a virtual network using space-based routers. AEHF also will help transform combat engagements through sensor-to-shooter compression; real-time maps; targeting information; and advanced intelligence, surveillance and reconnaissance for those who will make use of the information with swift, decisive outcomes,” Myers concludes.